CESR’s Ignacio Saiz, Executive Director, and Mihir Mankad, Program Officer for Rights Claiming and Accountability, recently participated in a roundtable discussion organized by Columbia University’s Institute for Human Rights and the Universal Rights Group concerning the catalytic role the United Nations Human Rights Council’s (UNHRC) special rapporteurs (SRs) play in the promotion of economic, social and cultural rights (ESCR). Other participants included a number of former special rapporteurs, such as Magdalena Sepulveda, Miloon Kothari, Catarina de Albuquerque and Farida Shaheed, along with representatives from academia, civil society and community organizations and the UN human rights system. Repeated themes included the relationship between mandate holders and other stakeholders and of ways to address gaps in knowledge and capacity on ESCR. 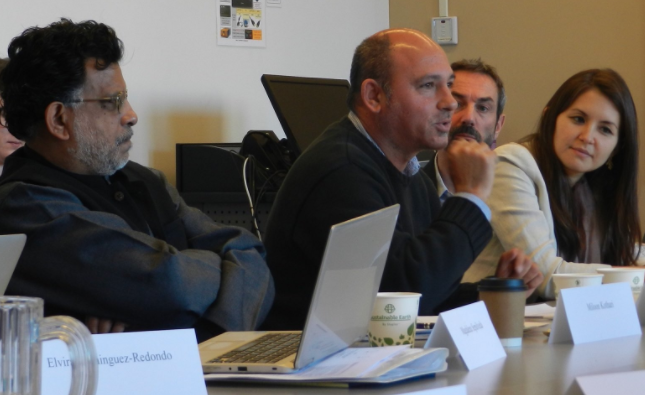 Ignacio and Mihir offered that civil society actors such as CESR can support mandate holders in areas where they might not have expertise, such as economic inequality and the examination of resources. The workshop discussions covered how special rapporteurs might better engage in the kind of structural change necessary to address ESCR violations. Some of the different tools of the mandate, such as the complaints mechanism, and working with other mandate holders on joint missions and submissions, were explored. Read more about the discussions here. CESR has a long history of extensive and fruitful collaboration with ESCR mandate holders on issues ranging from rights-based monitoring of the sustainable development goal on water and sanitation, to developing guidelines on austerity and human rights with the Independent Expert on Foreign Debt. As experts with a key role to play in pushing the boundaries of human rights thinking and understanding, many SRs on ESCR have cited CESR's analysis and information in their work. For example, CESR's work on the comparative marginalization of ESCR on the international human rights agenda is repeatedly referenced in the 2016 report on this issue by the SR on Extreme Poverty and Human Rights. CESR is fortunate to count two former SRs on its current Board—Magdalena Sepulveda (former SR on Extreme Poverty and Human Rights) and Miloon Kothari (former SR on Housing).